Surprise! 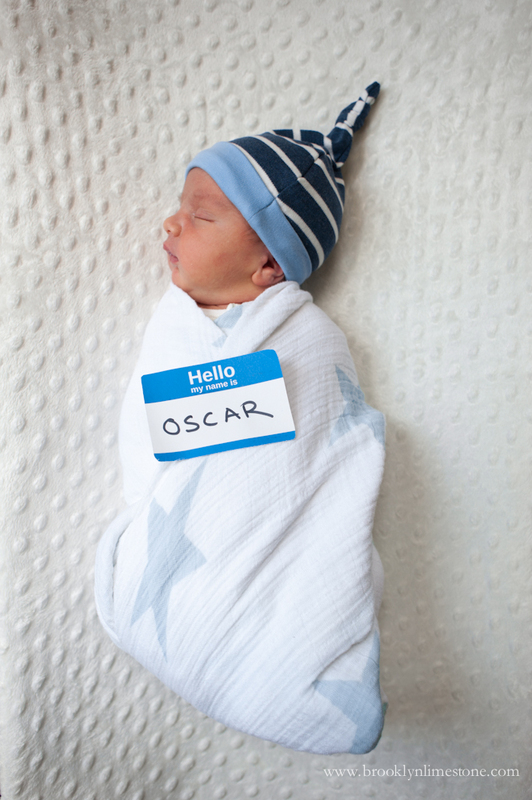 We welcomed baby Oscar last Saturday night and have been in the loving stupor that comes with a newborn ever since. So far, this little guy has been sweet and easy, making the adjustment as smooth as I could have ever hoped. For anyone paying attention you might have noticed he arrived a little earlier than planned. Due to a a medical scare, he got his eviction notice at 37 weeks. Despite this pregnancy being much more difficult than the one I had with Aggie, I was so not ready when my doctors broke the news to me that it was time! Ok, break the news is probably the wrong term - it was more like drag me to the hospital kicking and screaming. I really wanted those last 3 weeks to finish my to do list and mentally prepare for labor and recovery and having a baby in the house again - but you know what they say about god laughing at a plan? Well yea, that. Thankfully, it all worked out okay (my to-do list not withstanding) and we are feeling very lucky to a healthy, baby boy to complete our little family. While I plan to take it easy for a bit as I focus on the littles, I have some great projects to share over the next few weeks including the nursery reveal (see the design plan here), the country cottage patio (check out the living room and dining room) and a friend's beautiful gut renovation before and afters. And of course Halloween is coming (check out prior year's spooky celebrations) so I'll be putting my nose to the grindstone on those projects soon. As usual, I'll be sharing the occasional baby post here but if you want more frequent updates, follow me on Instagram for more of a real time look at what happens around here. i am so happy for you and i love that name! chris and i were chatting names the other day and that is one of my favorite boy names! Congratulations on the birth of your son. So happy for you and your family. Welcome to the world, Oscar! All the best wishes to you and your family. Much love!! Congrats S!! He is adorable. Enjoy all of the snuggles and coos and itty bitty diapers. Congratulations Stefanie! Oscar is adorable. Hope he continues to take it easy on you! Enjoy these early days. She said, "Oh, my lord! As your soul lives, my lord, I am the woman who stood here beside you, praying to the LORD. "For this boy I prayed, and the LORD has given me my petition which I asked of Him. "So I have also dedicated him to the LORD; as long as he lives he is dedicated to the LORD " And he worshiped the LORD there. Awww...he's precious! And what does Miss Agatha think of him? Congratulations! I never made it over 38 weeks, all my babies came early. I did miss the extra time to prep, but I was glad I didn't have to endure the last few weeks of discomfort. Good luck with the babes-love the name too. He is gorgeous! God bless him now and always. Congratulations! Congratulations! He's beautiful, he's healthy, you're fine, early is safer than late (ask your doctor) all is well. Enjoy him and his big sister! He's just beautiful. Hoping Aggie is over-joyed to be a big sister. Take good care of yourself and enjoy the newness of being a family of four (I remember how special it was for us : ) Congratulations!! He is perfection! There is nothing sweeter than a little boy growing into a man.